Arriving on Pag at the southern end across a big blue bridge, it felt like we’d landed on Mars. This is a very stark landscape, with red rocks strewn everywhere, no vegetation whatever, and the massive wall of Velebit looming across the channel. The lack of anything growing on the side of the island facing the mainland is due to the bura – that freezing winter wind that rolls over the mountain, rushes across the channel picking up sea salt spray and slams into the island, scouring everything in its path. As you would expect, there are no towns on the eastern side of the island. 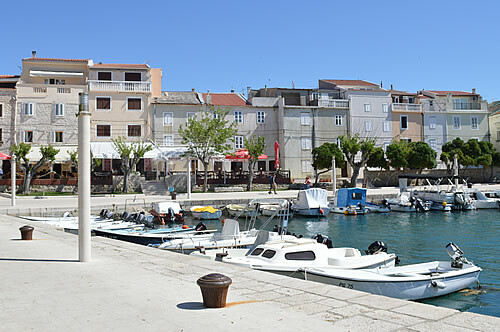 There’s rather more life around Pag town, which lies in a small inlet, one ridge over. It’s a pretty place, with a lovely little harbour, narrow streets and medieval walled centre. We find a market and buy a picnic lunch, which we eat with a view of the boats. Now, this is the new town. 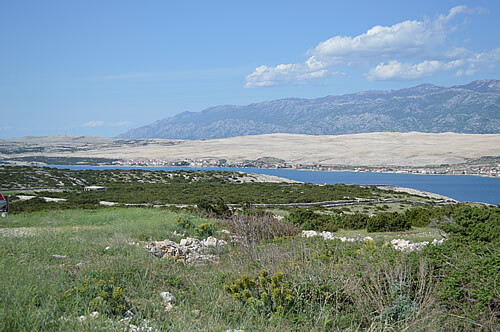 The old town of Pag actually lay on the far side of the salt pans, and dates way back to the Liburnians and Romans. It became a free royal town under the Slavs in 1244, and was fairly prosperous trading in salt, olives and cheese. However, following a particularly bad outbreak of the plague, the townsfolk decided to commission a completely new town from Juraj Dalmatinac, that inspired architect and stonemason. So it was in 1443, the construction of Pag new town began, and the old town was burned to destroy the last traces of the plague. 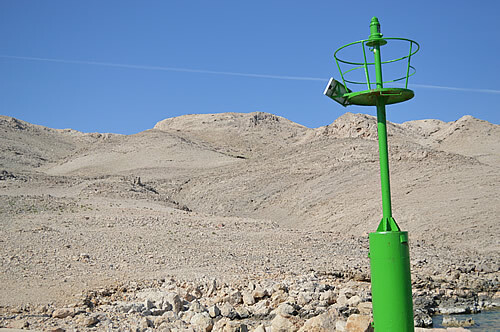 Leaving the town of Pag behind, we drive up and over over another ridge, and amazingly things are actually green here. Up towards Novalja, there’s a fascinating contrast in landscapes. 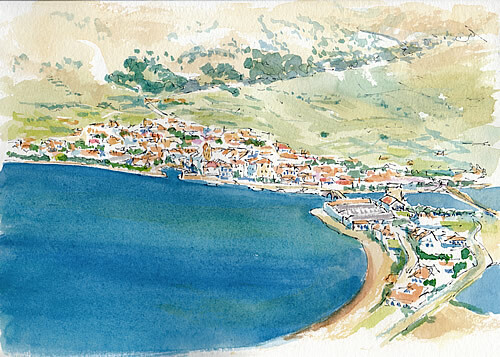 Nobody could ever call this island lush, but on the western side there are bushes and olive trees and plenty of aromatic plants, especially sage which appears to like sea salt. 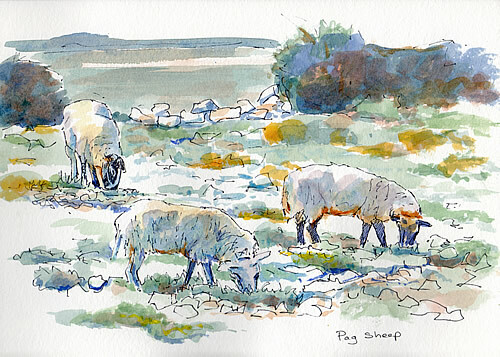 The sage is particularly appreciated by the island’s sheep population, a special small breed who are well adapted to the austere conditions here. There are around 40,000 sheep, about half of which contribute their milk to the island’s best known product – cheese! In fact Pag cheese has won many international awards, and is generally considered to be one of the best sheep’s cheeses in the world. 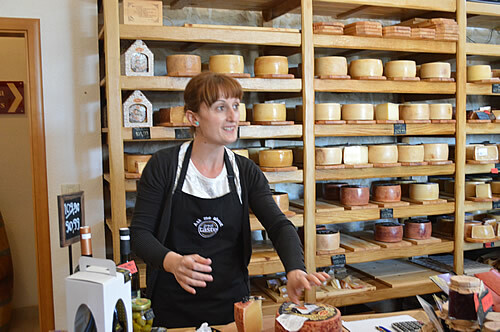 A visit to the cheesemakers coming up! After the shock of the Martian landscape, it was rather dislocating to find ourselves suddenly in wine country. This is certainly an island of contrasts! 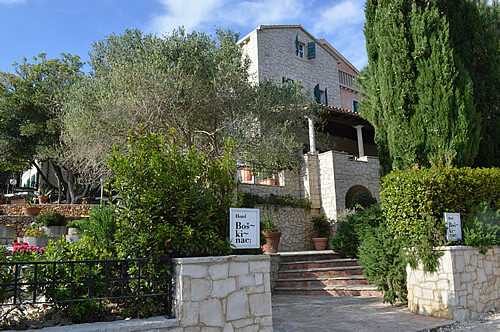 Boškinac is a very fine winery/restaurant with a small number of rooms – looking for all the world like a lovely manor house in rural France. Although it’s not as old as it appears, this is a wonderful place to stay, very relaxed and the perfect antidote to a week’s sightseeing. 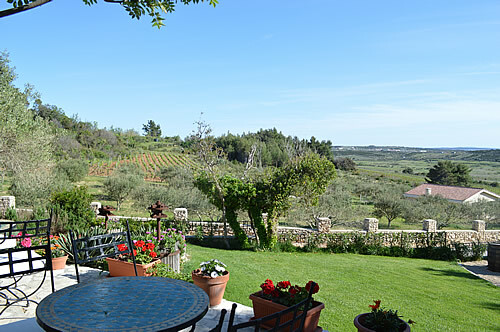 There’s a series of gorgeous terraces overlooking the vineyards and olive groves. It’s shady and beautiful – and so green. We settle into our room and head straight for the terrace and a drink. Boškinac’s house white is a simple easy-to-drink summer wine, just exactly what’s needed after a parched day on Mars! And as we’re staying at a winery and restaurant, we’re looking forward to trying some of the wines and the gourmet menu. In early May, it’s pretty quiet, with only a few other guests, although it seems to us to be a perfect time to visit! Starter: Pag burata cheese in two versions: for himself (the meat eater), it’s wrapped in prosciutto, on sliced tomato and fried bread with oregano garnish and a drizzle of olive oil. My veggie version comes with fresh tomato salsa and nettle pesto, olive oil drizzle, and fleur de sel. I love the soft cheese skuta, which just melts in your mouth. Very, very tasty! 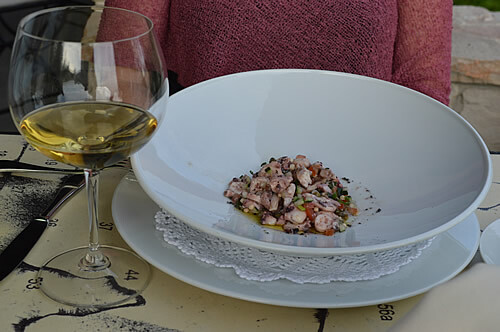 Moving on to a light white – Boškinac Grand Cuvee 2010 – which accompanies our next course, an Octopus salad, very yummy! 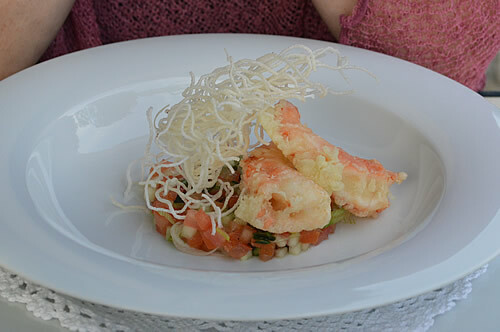 Still with the same wine, the salad is followed by Tempura scampi on a bed of diced cucumber, tomato and spring onion, with a delicate vinaigrette and topped by rice vermicelli. Looks and tastes wonderful! 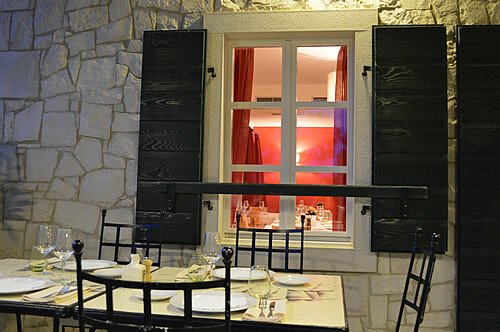 To go with my main course, I revert to the lighter Boškinac house white, which I had enjoyed so much on the terrace. 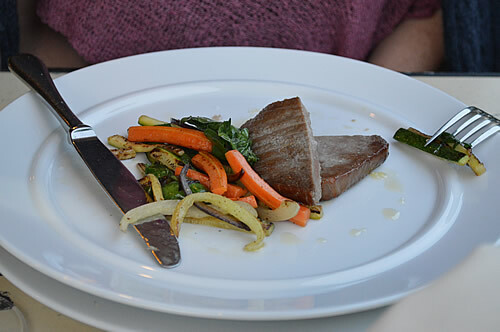 And my main course is Grilled tuna on bed of grilled veggies – very delicate and moist! 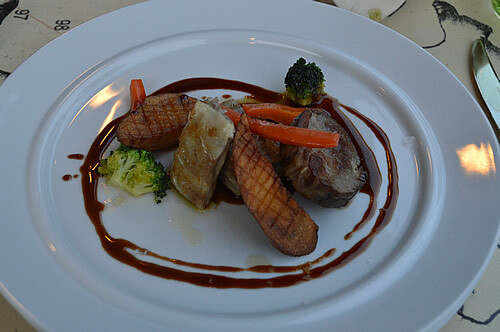 For himself, the main course was lamb shoulder and belly, slow cooked, with roast potatoes, carrots and jus reduction, served with a red Boškinac 2011, after considering the Rožolj Syrah. All declared to be very tasty! 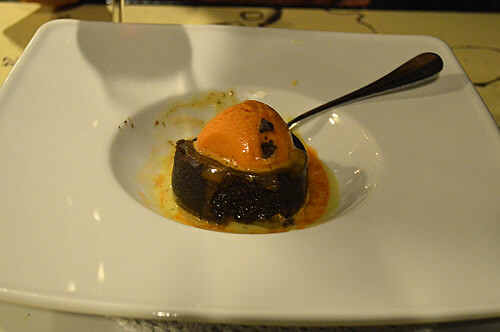 Moving on to dessert: we had carrot souffle, a sorbet-like light ice cream on a choccie cake that just melted in the middle, with fennel cream. Unusual use of carrot for dessert, I must say, but worked really well! 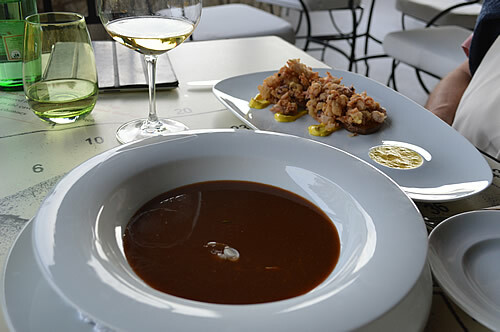 To go with the desserts, we enjoyed a glass of Boškinac prošek, and also tried the Kozlović Muškat. 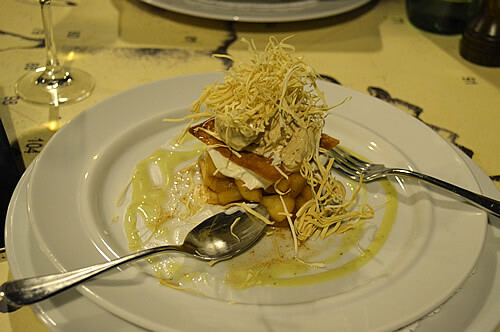 The alternative dessert was an apple compote on crispy pastry with fennel cream and cinnamon ice cream, topped with crispy noodles. A stylish variant on apple pie – lovely and light, and interesting combination of flavours! And to round off our gourmet evening, a glass of rakija od borovnice (blueberry liqueur) and a camomile tea. Our stay on Pag came as a welcome change of pace from the rest of the trip, when each day was carefully planned. 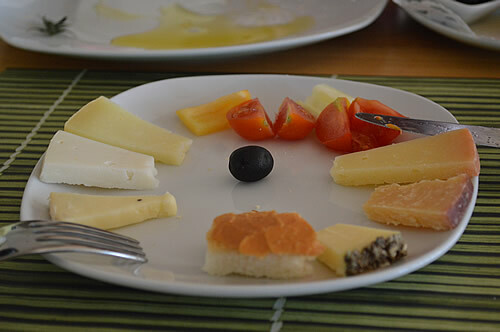 Our leisurely breakfast at Boškinac had a wonderful choice of local produce, including lots of cheeses! It’s warm enough to take it outside, and enjoy breakfast with a view. The rest of the morning passes in slow mode, a chance to paint and catch up on email, and just be here. No medieval towns or museums in our itinerary today! But we do have other, more energetic plans for our afternoon! 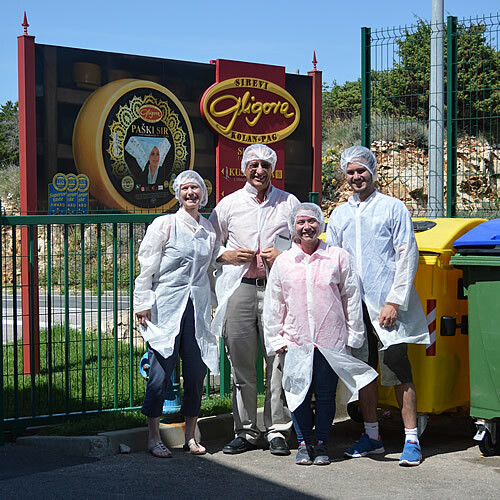 We’re off to Kolan for a tour of Sirana Gligora, the second largest cheesemaker on the island, and the recipient of many international awards. And for that we have to don protective coats, hats and slippers before we’re allowed to enter. One size fits all (but not well)… and oh, so stylish! As we enter on the ground level there’s a large room where the incoming milk each day starts its processing. After heat treatment in the pasteuriser, the milk is pumped into cooking vats, where the magic happens. The curd is pressed into moulds for 4 hours, while the whey is separated off ready to make skuta (ricotta). After pressing, the young Paški sir will sit in salt water for 24 hours, to help the rind get started. Then, after a further 24 hours on a drying rack, the cheese is moved down to the cellar where it will mature over the next 90 days. The whey, meanwhile, has been heated to a very high temperature and the resulting Paška Skuta is delivered fresh each day to local shops and restaurants. Sheep cheese is a seasonal product, only from May to August, when the ewes are nursing their lambs. 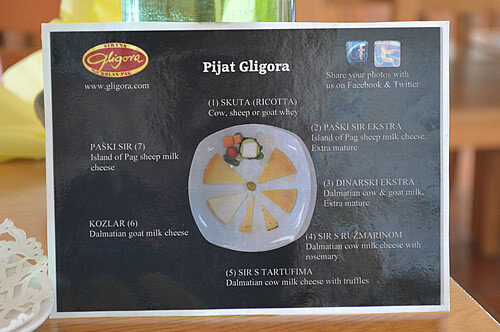 That’s what Sirana Gligora is most famous for, but they also make cheese from goat’s milk and cow’s milk, both of which come from the mainland. From the main processing room, we took the lift down to the permanently cool part of the factory, the storage cellar, where racks upon racks of cheeses spend months maturing. 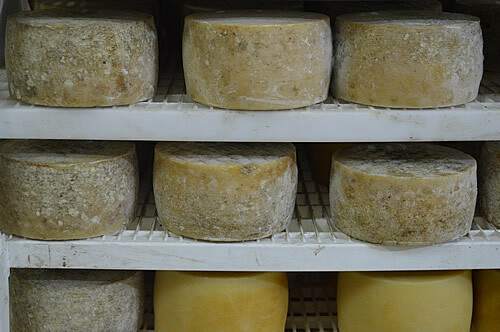 Mould starts to grow on the cheeses, which are turned every 2 weeks to keep everything even. From admiring the young cheese in the cellar, it’s up to the tasting room at the top of the house for a chance to sample the various different products. We opt for the 7 cheese special and a couple of glasses of wine. Accompanying the cheese was some local olive oil, olives and jam. Our cheese tasting platter is organized to match the instructions on the sheet above – that’s handy! They’re all really tasty, but I particularly like the skuta and the extra mature Pag cheese with the wine (a glass of Plančić plavac). The cheese shop downstairs offers a full selection of their products, so we bought a wedge of the Paški sir, and one of the Ekstra. They also had some cheese with lavendar, which we had to try! 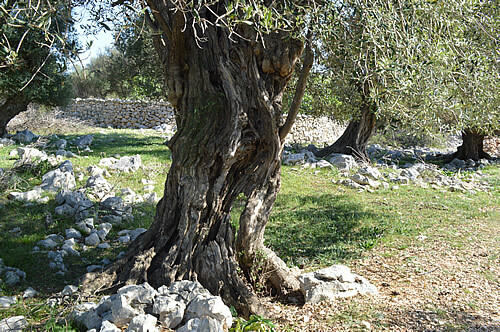 After our cheese tasting, we headed up to the Lun peninsula in the north of the island to see the ancient olive trees. This is one of the largest collections of wild olives with over 1,500 trees with an average age of 1,200 years. The oldest has been dated at an impressive 1,600 years. The Olive Garden of Lun has recently been made into a very attractive park, where you can follow paths around and look at these amazing survivors of the harsh conditions on Pag. 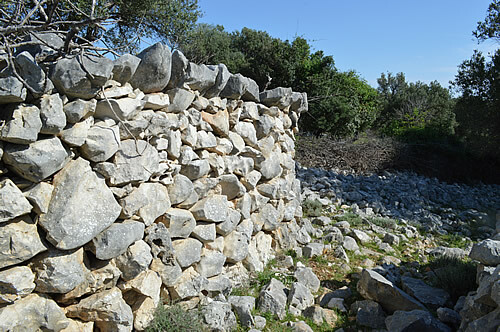 Interestingly, the drystone walls here have a local variation, known as ozuba, to keep out the sheep. The top row is formed from larger slabs that stick out over the edge, preventing the sheep from leaping over. 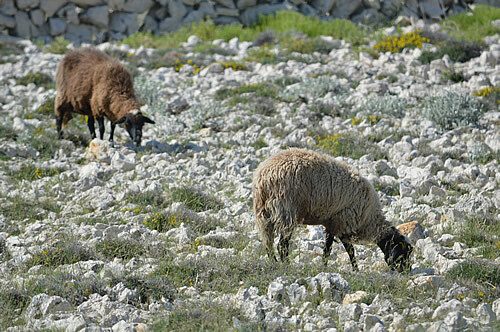 They really don’t want the sheep nibbling at the olives! 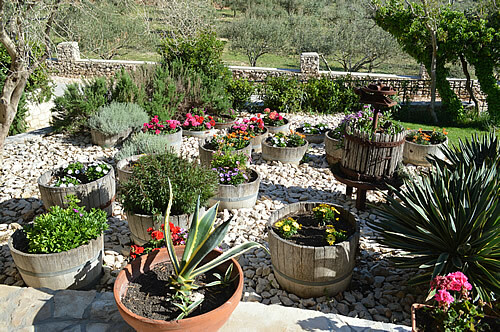 In fact, the olive trees here are pruned in a different way to say, those on Hvar, where the branches are kept low to the ground for easier picking. Pag olive trees have their branches cut much higher. After the cheese and the olives, now for the wines of Pag! 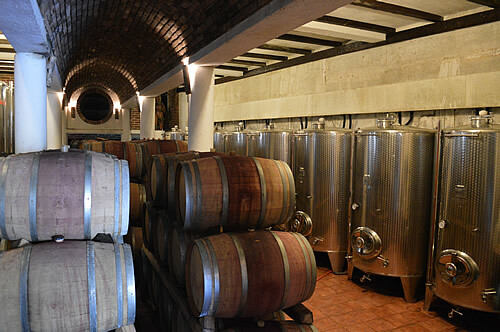 We have a tour of the Boškinac cellars and a special barrel tasting of wines given by sommelier Marko Šram. He’s very knowledgeable and helpful, and has won several awards himself! 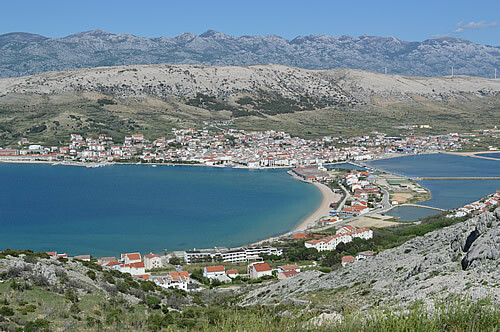 The gegić grape is local to the island of Pag, and has been recently revived from near extinction by Boškinac owner and winemaker Boris Šuljić. 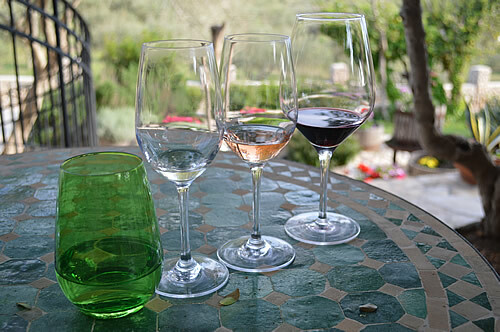 The wine is light, almost green in colour, with aromas of sage flowers, honey, and a hint of lavender. This is a nice simple drinkable wine, with a bit of sweetness on the tip of the tongue, then acid and minerals with a nice finish and a hint of bitterness. Comes in at just under 13% alcohol. Light rosé colour, similar to Tavel. Aromas of smoke, fresh iron, machine oil and crushed rock. To the taste, more rounded than the Gegić, with an impression of sweetness, but still quite strong acid spreading in the mouth. Hardly any aftertaste, or any bitterness. Very enjoyable! Pretty opaque deep red in colour with a hint of violet round the edge. Aromas of crushed red fruit, blackcurrent, plums, and a hint of liquorice and possibly leather/tobacco. Quite wild tannins and good acidity, and a taste of blueberry, and minerals with a long finish aftertaste on the roof of mouth. Very young yet, but promising! Earlier vintages have all been rated in the top tier of Croatian reds. 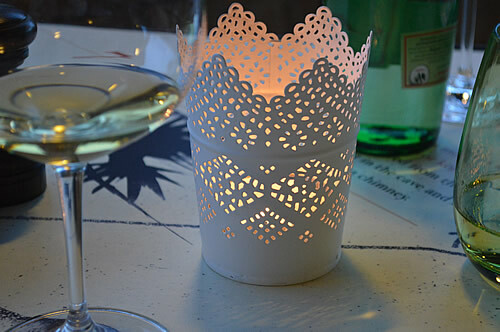 And to end our day of hedonist pleasure, we enjoyed another candlelit dinner in the restaurant, this time selecting from the menu. We’re really enjoying the Tomac bubbly, which makes a great start to any meal! For our different starters today, we have one amusebouche of flaked tuna with onion and capers on toast, and one plate of skampi soup. 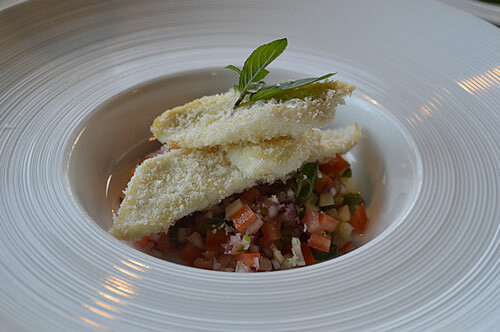 Moving on to the main courses, we have Sole on campanella salad, served with a glass of Ocu. 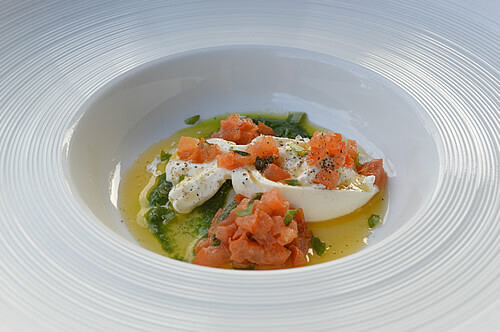 Very light flavours and good combination – tasty! Ocu is a special white made by Boris Šuljić as a tribute to his father (Ocu is Croatian for “to my father”). A blend of indigenous white varieties, it undergoes extended maceration and spontaneous fermentation, just like whites were traditionally made in the past. Makes for a rather more flavourful white than most. 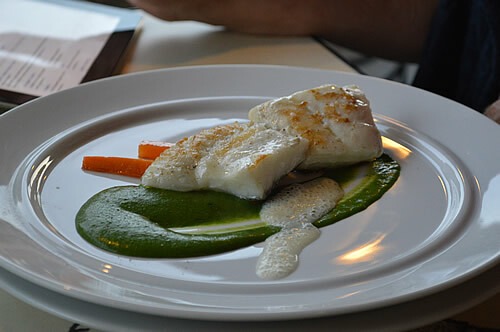 And himself had the Filet of turbot on liquid blitva, with a glass of the Rožolj syrah. 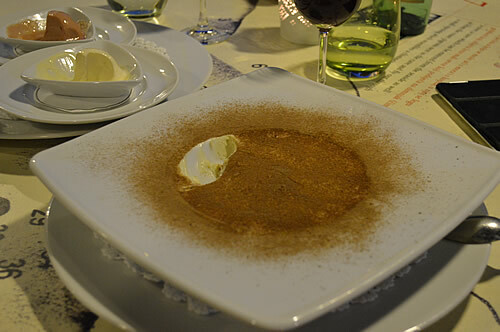 A combination of desserts to follow, each with their own recommended wine: (1) Strawberry sorbet and Sage ice cream served with a Kozlović Muškat Žuti, and (2) Pag Tiramisu served with the Boškinac Prošek. All very tasty and lovely, but wow, that Pag tiramisu is outstanding! And to round it all off, a glass of borovnica, that wonderful blueberry liqueur! And finally, a few of my sketches from Pag. 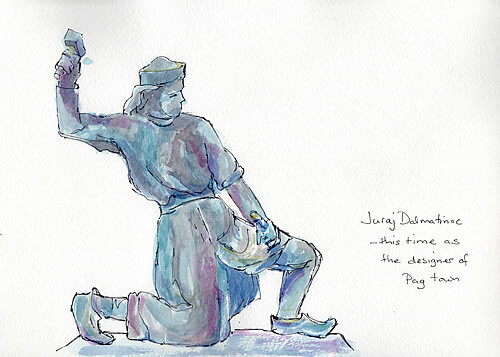 Firstly from the town of Pag itself – the life-size bronze statue of Juraj Dalmatinac, the stonemason that designed and built the “new” town.